One of the Best Books of the Year The San Francisco Chronicle * The Philadelphia Inquirer * Vox * The Globe and Mail (Toronto) From Tim Wu, author of the award-winning The Master Switch ( a New Yorker and Fortune Book of the Year) and who coined the term "net neutrality"-a revelatory, ambitious and urgent account of how the capture and re-sale of human attention became the defining industry of our time. Ours is often called an information economy, but at a moment when access to information is virtually unlimited, our attention has become the ultimate commodity. In nearly every moment of our waking lives, we face a barrage of efforts to harvest our attention. This condition is not simply the byproduct of recent technological innovations but the result of more than a century's growth and expansion in the industries that feed on human attention. Wu's narrative begins in the nineteenth century, when Benjamin Day discovered he could get rich selling newspapers for a penny. Since then, every new medium-from radio to television to Internet companies such as Google and Facebook-has attained commercial viability and immense riches by turning itself into an advertising platform. 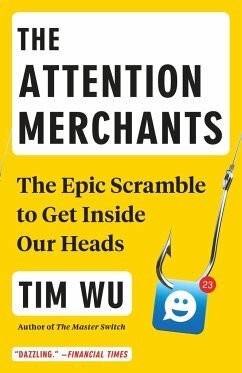 Since the early days, the basic business model of "attention merchants" has never changed: free diversion in exchange for a moment of your time, sold in turn to the highest-bidding advertiser. Full of lively, unexpected storytelling and piercing insight, The Attention Merchants lays bare the true nature of a ubiquitous reality we can no longer afford to accept at face value.